Rosh Yeshiva of Ateret Yerushalayim in the heart of the Old City of Jerusalem. Rav of Beit El & one of the leading Rabbis of Religious-Zionism today. One of the most prominent students of Ha-Rav Tzvi Yehudah Ha-Cohain Kook, who followed directly in the footsteps of his father, Rav Kook. Author of more than 150 Hebrew books filled with love of Am Yisrael, Eretz Yisrael & Torat Yisrael, tolerance & love to all Jews, guidance for harmony within the Jewish family, dedication to the State of Israel & Tzahal, and facing the most pressing questions of the day. When Ha-Rav Shlomo Aviner served as the Rabbi of Moshav Keshet in the Golan, in the shadow of Mt. Chermon, he delivered a weekly class on Parashat Ha-Shavua focusing on its connection to our national and personal soul. 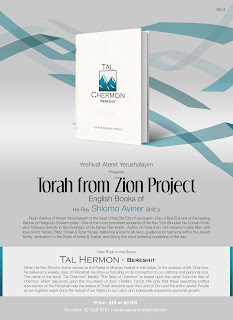 The name of the book "Tal Chermon" literally "The Dew of Chermon" is based upon the verse "Like the dew of Chermon which descends upon the mountains of Zion" (Tehillim 133:3). We pray that these beautifully-crafted discussions on the Parashah help the waters of Torah descend upon the Land of Zion and the entire Jewish People as we together experience the revival of our Nation in our Land, and individually experience personal growth.